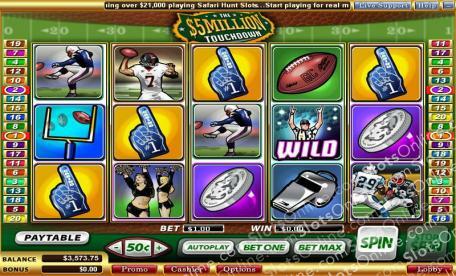 This is one of the most popular slots at SlotsOnline. Click here to play! The play symbol is a scatter. If you spin two or more anywhere on the board, you will multiply your total bet by 20, 125, or 500. If you spin three or more anywhere on the board, you will get 15 free spins. Plus, if you spin five anywhere on the board while betting max and playing the max number of lines, you will win a massive payout worth $5 million. The Referee is a wild symbol. It will replace all other symbols, excluding scatters and bonuses, to help you bring in more winning combinations. It also has a max payout of 15000 times your line bet if you spin five across an active payline. If you spin two bonus target symbols on a payline, you will trigger a bonus game. During this game, you will continue up a pyramid, picking a square for a prize, until you fumble the ball.